The body of the stein is a smooth, black glazed, high quality stoneware decorated with a platinum wrap around design. Created in honor of those involved in the Liberation of Afghanistan, this stein details the timeline of the conflicts with Afghanistan. A pewter medallion featuring a map of Afghanistan with an eagle clutching a U.S. flag is fixed at the center of the wrap around decoration. 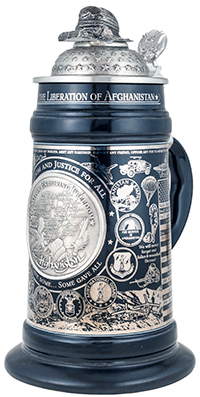 Framing the medallion on the body of the stein are the words, FREEDOM AND JUSTICE FOR ALL, and the seals for the United States Coast Guard, Navy, Army, Air Force, Army National Guard and Air National Guard. Rows of raised stars decorate the ornamental pewter lid and fixed to the top is an intricately detailed pewter figurine of a desert military helmet resting on top of a U.S. flag. A pewter version of the U.S. eagle crest serves as the thumblift for this noble stein.